Products belonging to Audry will be shipped separately from other products. Eye: A dark, mahogany and garnet red. Nose: Complex and rich aromatic palette. Green pepper, fresh apple, tobacco, spices, roasted coffee beans, cocoa and rancio. The result is sumptuous and lingering. Palate: Full bodied, mellow with a subtle note of anis, violet and licorice. A smooth and honeyish aftertaste that is satin to the palate and lasts a long time. You will not find AUDRY locally, and we offer the best international price per bottle. If you find these bottles cheaper locally, we will match the price. An exquisite and beautifully presented Fine Champagne blend, the Audry Mémorial Cognac will certainly take you on a journey of its long maturation process with such a complex palette of flavors and aromas. A blend of eaux-de-vie of nothing younger than 30 years, and up to 60 years in age, it is a rare and rich Cognac with notes of butter cream and pine. An intricate blend of eaux-de-vie from both the Grande and Petite Champagne, it is clear that the Master Blender selects only the most prestigious from the Audry Paradis Cellar. First made in 1978, it contains eaux-de-vie from the Réserve selection of the cellar, which Bernard Boisson decided to revive after the family tradition had lay dormant. Descending from the two premium crus of the Cognac region, the fine, light and floral character of the Audry Mémorial is undeniable. These areas are unique, in that they have developed particular properties from millions of years of fossilization. The soil contains a high content of chalk and benefits from a maritime climate, which makes for easy drainage and refined eaux-de-vie. Then aged for decades in barrels of oak from the Limousin and Tronçais forests, they infuse with the tannins of the wood slowly and progressively and oxidizing with the cellar atmosphere. Only releasing a limited number of bottles per year for their Cognacs, Audry focus on quality and high value in production. Audry Cognac seek balance in their fine blends, and to create the Audry Mémorial Réserve, the process is particularly unique. During distillation in copper alambic Charentais stills, a swan’s neck pipe is used to give the eaux-de-vie its aromatic quality, by directly extracting the bouquet from the grapes and distilling to 42%. This way, the character of the terroir is respected. After biding their time in dark, rich oak casks, the eaux-de-vie are blended by the Master Blender with expertise and generations of savoir faire. They are left for at least two years once again before bottling. Neat at the end of a meal, or with a fine cigar. The Audry Mémorial arrives in a tall bottle, sealed with black wax. The label is classically black and white, with a gold-leaf sketch of the estate included. The chic presentation sleeve matches the color of the eaux-de-vie; a gorgeous garnet red. 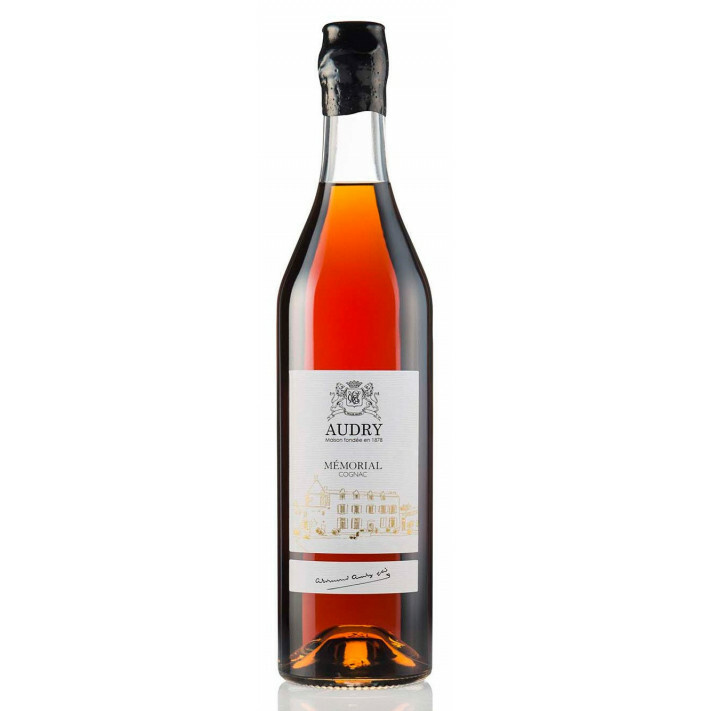 Audry products are shipped separately from all other products on Cognac-Expert.com. When Time Magazine reported that ‘the best Cognac you’ve never heard of is Audry’ back in 2005, this small, artisan Cognac house was catapulted into the limelight. Since then, their products have become known in countries throughout the world and among some of the most prestigious restaurants – including those in Europe, Scandinavia and North America. However, just because a few years ago the name of Audry Cognac had not really been heard of outside of France, this does not mean that the house doesn’t have a long and illustrious history. This family run Cognac house has a story that dates back to 1878, and despite keeping a series of older casks in chai, they stopped selling their bottles in 1950. This has arguably been the secret of their success; in 1978 when Bernard Boisson ignited the renaissance of the Audry Cognac brand, he had one of the most precious cellars of decades-old eaux-de-vie to dive into and begin blending exceptional Cognacs once more. Fine nose with a strong rancio, fruits, citrus and dry tobacco and spices. An amazing and opulent product. Count yourselves lucky if you can still find one. Superb ,simply superb cognac. None of the simple sweetness of your favorite Liquor store brands, none of that consumer-favorite vanilla crap. Pure tar, licorice, with flower and honey hints on herbs and smoke and dry fire. The most complex drink I have ever tried.Not for nothing it is Cognac served at La Vefour.